O’Keefe Timeline: link (unfortunately, the BDE coverage is currently missing). Note: According to Davies, MCC provided $200, and the entrance fee was $50 / player, making the full account of the prize amount. This needs confirmation (see here NYTrib 1900.10.23 p4 for entrance fee), e.g. see BDE 1900.10.02 p17. 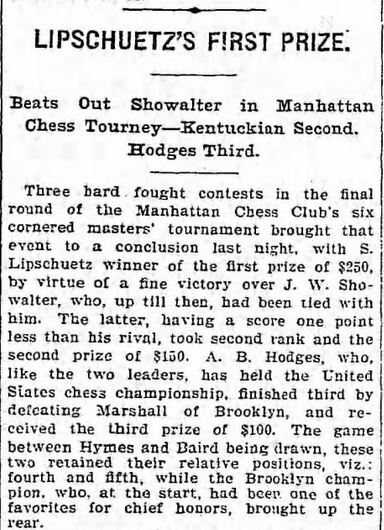 This tournament was sponsored by the Manhattan Chess Club in late 1900, a year which saw the club sponsor many extra events besides their annual championship. This was perhaps the culmination of those extra events (which including various matches). The total prize money to be awarded was $400 ($500), and some of strongest national talent was invited. Kemeny of Philadelphia was unavailable, and his place was taken by D. G. Baird of Manhattan. Showalter came from Georgetown, KY, and the other players were from NYC (Brooklyn, Manhattan, and Staten Island – see BDE 1900-10-12 p17). The match was originally scheduled for Oct. 15, but actually began a week later, with a special early game on Oct. 22. I believe the delay was to accommodate Showalter (see BDE 1900-10-18 p16). The playing schedule was three games / week (Tues, Thur, and Sat), lasting for 10 rounds in a six-player double round robin. The tournament was denoted as the “six cornered tournament” in most of the press coverage – but to be consistent with other tournaments, it’s denoted as a hexangular tournament here. With the exception of Lipschutz, all the players were to play on the American team in the upcoming international cable tournament. This tournament is notable for Marshall’s disappointing play, as he finished in the very unfamiliar spot of last place. For an even more scorching review see Phrady’s commentary: BDE 1900.11.11 p12. 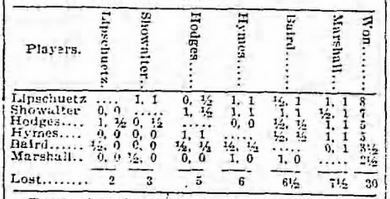 In the Pittsburg Dispatch on November 12, 1900, Napier wrote: “Lipschütz’s play is not at all entertaining, but is none the less correct and sound. He is blessed with a prodigious patience, which, coupled with a certain cunning, renders him a very formidable foe. Victory in this tournament lifted Lipschütz’s Edo Historical Rating to its peak of 2605 and equal fifth place with Schlechter. It turns out that LOC has the NY Tribunes issues covering this tournament, and they published all the game scores. However, I assembled the tournament before finding this resource, and so none of the games in the PGN are sourced (currently). Side note – McKinley and Roosevelt were elected in the middle of this tournament.